My husband and I have been patients of Dr. Veatch's for years. Dr. Veatch is very thorough, and carefully looks for changes in our eye health. He explains things better than other eye doctors and genuinely cares about our long-term eye care needs. We were so excited when he moved his office back into North Liberty! When our daughter needed glasses at the age of one, we priced out several different locations and decided on Vision by BLINK because of their awesome warranty on children's frames and lenses. We are so incredibly thankful we did! 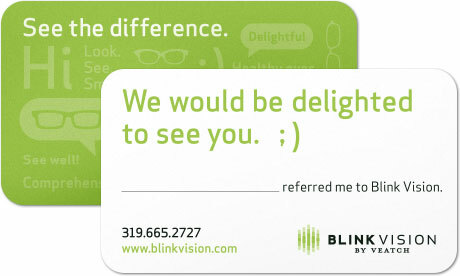 We had many accidents with a toddler in glasses and the staff at BLINK were always understanding, patient, and helpful! BLINK stands by their products and were always willing to work with us. They made the transition to having a toddler in glasses as easy as it can possibly be. Everyone at BLINK is so warm and friendly; my daughter loves coming into the office, as do we! We always enjoy coming in to see everyone at BLINK and will be loyal customers for years to come! We have been under the care of (one or the other) Dr. Veatch for 30 (?) years. Our family really appreciates how the doctors and the entire staff at Blink Vision go above and beyond to ensure the best quality of sight and healthy eyes. There is a great selection of frames and the customer service is excellent before, during, and after the sale. My family has been cared for by Dr. Veatch and his team at Blink Vision for several years. From our children's first eye exams to my investigation into bi-focal lenses, they instill unwavering confidence that we are in good hands. Blink Vision cares as much about the health of our eyes as I do. I can’t say enough good things about Dr. Veatch and how he helped our family through a difficult time when our child experienced a serious eye injury that required surgery. On his day off from work, Dr. Veatch took the time to discuss the situation with me, and helped bring a sense of peace and clarity to a stressful situation. Dr. Veatch is the gold standard when it comes to patient care. The staff at Blink Vision has been extremely friendly & patient with my 9-year-old. They’ve helped him find the perfect pair of glasses each time. He actually likes going to the eye doctor. Blink Vision has excellent service. They are very speedy and helpful, especially with our young son who hasn’t been particularly easy on his glasses. After dealing with red, irritated eyes for months and not finding a resolution with my family doctor, Dr. Ryan Veatch took the time to figure it out. Now I’m on the road to learning proper care for my dry eye problem. Dr. Ryan Veatch always takes the time to listen to his patients concerns and to help them find a resolution. Everyone at Blink Vision is so knowledgeable and friendly. They’re always there to help you out. Dr. Ryan Veatch is very thorough and explains his findings in terms that I can understand. Dr. Veatch and everyone there are awesome! !